New Delhi. 15 January, 2016. As the nation celebrates its 68th Army Day , the glitter and the glamour of the olive green, which some would think had diminished, is still a major attraction for the generation now and India is even today the largest voluntary army in the world. 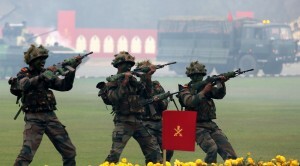 Fighting the unknown enemy, combating a known enemy at the borders, training in peace for war, helping administration at times of natural calamities, at the forefront in man-made disasters, developing skills for a technically strong army and creating a legacy of valour and sacrifice—- this is what the Indian Army’s soldier is —- forever forward. 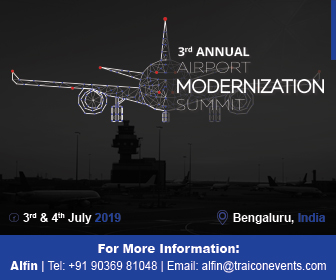 But what very few know is that, innovation is the new mantra for these men who understand their equipment and future needs the best. And the moral of our story is— you don’t have to be a scientist to innovate and come out with the best products which promise to fulfill our needs. Soldiers, Junior Commissioned Officers and Young Officers of the Indian Army have just done this. 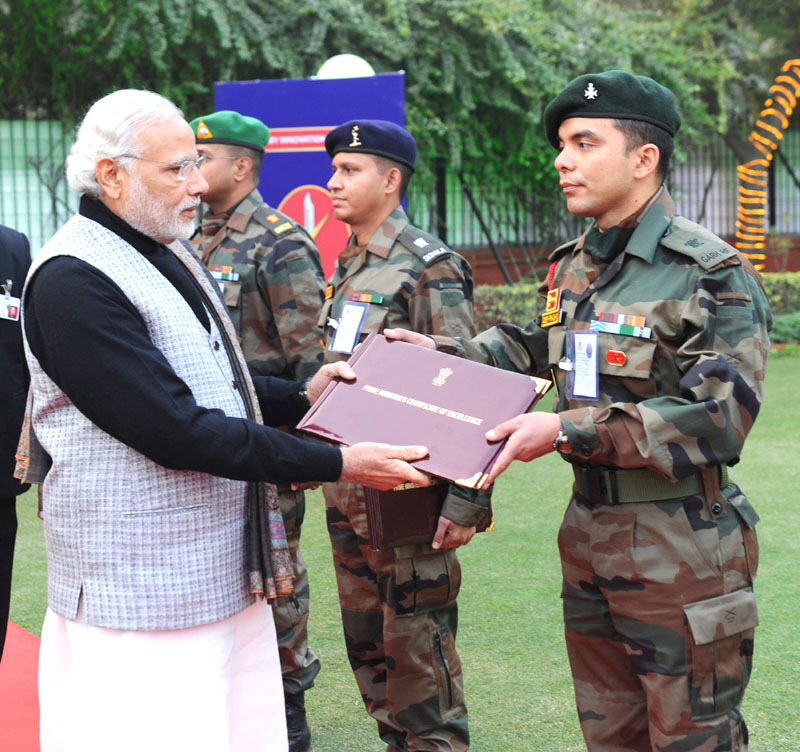 Prime Minister Narendra Modi reviewed the various innovations made by these men at the Army Day At Home. 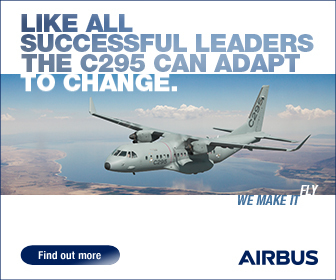 The innovations ranged from creative modifications for enhancing operational capability of existing weapon systems and equipment, development of Information Technology applications, simulations, expedients for facilitating operational and logistics capabilities to creating workable solutions for indigenisation of spares and components. 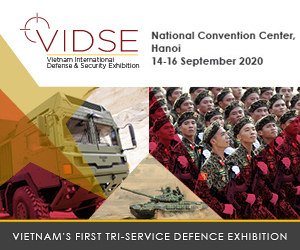 The shortlisted innovations were based on an exhaustive selection process where all Army Commands were encouraged to carry out their own in-house selections before the Army level selections for suitable innovations were made. 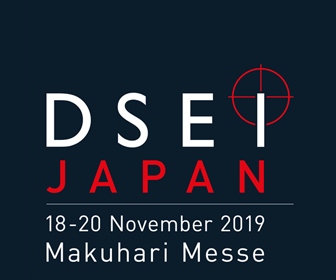 From an Anti Tank Guided Missile Simulator , Communication System for Heliborne Operations , Landing Indicator for Heliborne Operations, ‘Deesha’ – Android Application for Converting Data to Indian Grid Reference System, Modified INSAS / AK-47 Rifle for Counter Terrorist Operations, Infiltration Detection System, Artillery Fire Control simulator, Road Wheel Re-Rubberisation for the entire range of weapon, Video Facility on Army Mobile Cellular Communication System, to Improvised Mobile Air Defence Gun System, this Army Day had it all from its own home grown technical talent. Every year Indian Army celebrates 15th January as ‘Army Day’ to commemorate the day when General (later Field Marshal) K.M Carriappa took over the command of Army from General Sir F.R.R Bucher, the last British Commander-in-Chief in 1949 and became the first Commander-in-Chief of Indian Army post Independence. 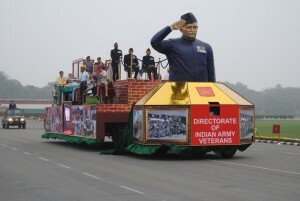 On the occasion of Army Day, an impressive parade was organised at Army Parade Ground, Delhi Cantonment, where Army contingents including seven Mechanised (T-90 Tank, BMP II, Brahmos Missile System, Akash Missile System, Smerch Multi Barrel Rocket Launchers, Troop Level Radar and Integrated Communication Electronic Warfare System) and nine marching contingents participated. 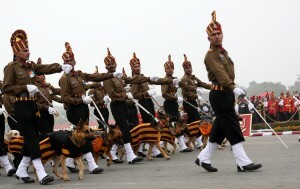 The marching contingents also included an Army Dog Contingent wherein the dogs and their trainers marched in unison past the saluting dias. 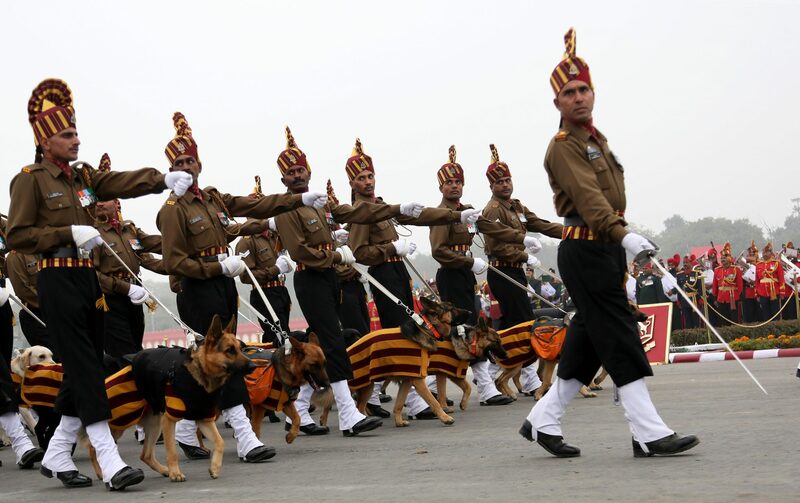 The Army Dogs are utilized for specialist jobs like explosive detection, tracking, guarding and assaulting. Tableaux of Indian Army as also of the Veterans depicted their role and contributions towards the nation. Motorcycle display by the Army Daredevils was the other attraction during the parade. 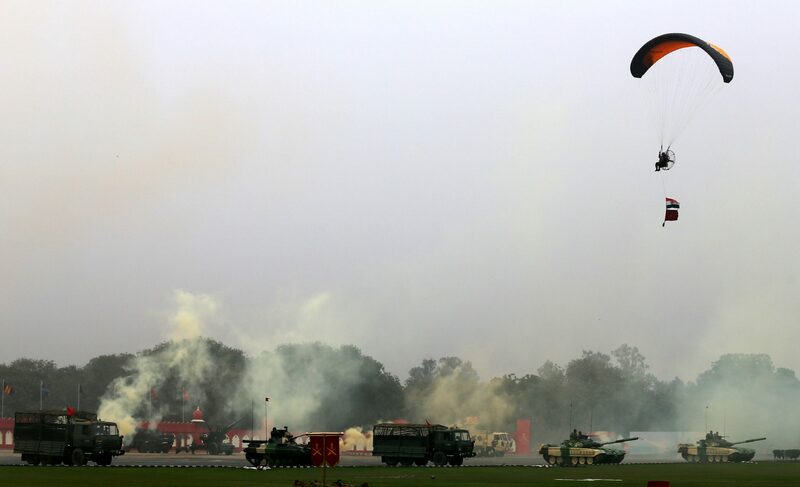 A grand finale was a combat demonstration, which showcased battle drills and combat techniques of the Army units. Combat actions included heli-dropping by the RUDRA armed helicopter & special tactics for insertion and extraction of soldiers behind the enemy lines were depicted. 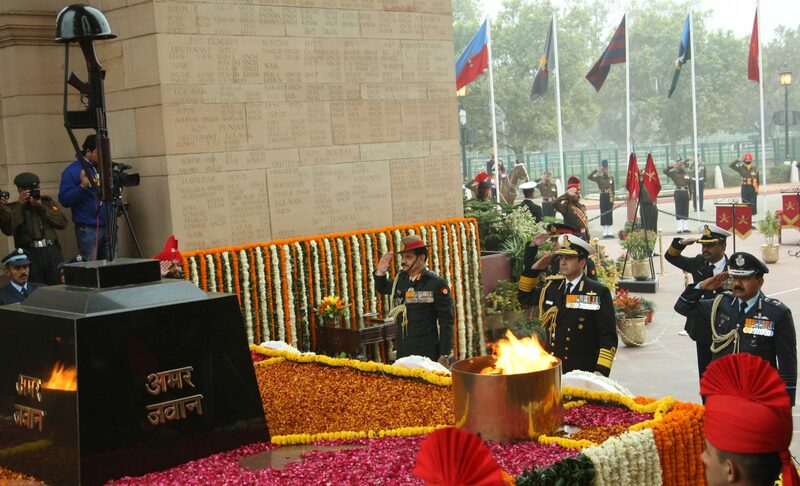 Earlier in the day, wreaths were laid at Amar Jawan Jyoti, India Gate by the three service chiefs to commemorate the Army Day. 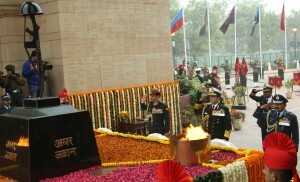 General Dalbir Singh, Chief of the Army Staff reviewed the Parade at Army Parade Ground, Delhi Cantonment and awarded fifteen Sena Medals (including five posthumously) for individual acts of Gallantry and thirteen COAS Unit Citations for commendable performance of their respective units.